Every year thousands of young athletes sustain traumatic dental and head injuries while playing sports. These injuries occur in all sports, including football, lacrosse, soccer, basketball, hockey, field hockey, cheerleading and many more. The positive thing is that most of these injuries can be easily avoided if the athlete wears a well-fitted mouthpiece while active in the sport. Mouthpieces can save the teeth and jaws from significant dental injury, and they can also significantly reduce the severity and occurrence of sports related concussions. As an orthodontist, I can attest to the fact that in my practice, I see more traumatic basketball and soccer sports related issues than in all other sports combined! The main reason why this is the case is because most other sports require the athletes to wear a mouthpiece, or else the athlete is not allowed to take the field. Most orthodontists and pediatric dentists would love to see the same rules apply to basketball and soccer as well. The use of a mouthpiece during practices and games is the single-most effective way that you as a parent can prevent your children from sustaining a traumatic and expensive dental injury while playing any game that may involve contact. A traumatic dental injury can cost you many thousands of dollars long term, as well as many years of additional dental care for your sons. The sooner children get used to wearing mouthpiece when playing a contact sport, the more uncomfortable they will feel whenever they play any sport in the future without them – which is exactly what we want. 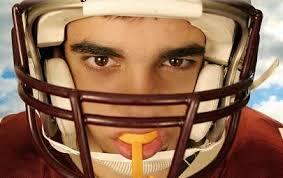 Most sports stores sell stock mouthpiece that the athlete can boil, and then fit and shape in the mouth directly. Once an athlete has all of their adult teeth, the best option is a custom mouthpiece that is fabricated by your child’s dentist or orthodontist. With these mouthpieces, the athlete comes into the dental office for a mold (impression) to be taken of their teeth. This mold is sent out to a dental lab which will fabricate a perfectly fit mouthpiece, that because of the perfect and unique feel, will be much more comfortable for the athlete to wear. Most professional athletes wear custom mouthpieces as opposed to the stock mouthpieces for this very reason. Finally, one of the least advertised, but most important advantages to wearing a well-fitted mouthpiece is that they help to prevent concussions. Many concussions are caused by the traumatic high-speed slamming of the lower teeth into the upper teeth that sends damaging shock waves straight to the brain. If the athlete is wearing a well-fitted mouthpiece, this brain trauma is significantly reduced or even eliminate – as there is now a 3-4 mil thickness soft acrylic shock absorber (mouthpiece) in between the upper and lower teeth. As a father of very athletically involved sons and an orthodontist, I have never allowed my boys to play any of the aforementioned sports without a well-fitted mouthpiece. My goal is simple – protect their teeth and jaws from traumatic injuries, and protect their brains from the damaging effects of a concussion.